English speakers, don’t click away! Although this book’s full title is Sentir, ressentir. Parfumeurs, odeurs et émotions, every article is in both French and English. If fragrance interests you — if you want to know more about how perfumers work, what inspires them, how fragrance intersects with emotion, and a lot more — you’ll want to read this book. 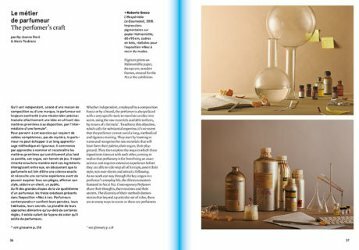 Sentir, Ressentir was published this month by the people who put out the magazine Nez to accompany two perfume exhibitions in Lausanne, Switzerland: “Nez à Nez. Parfumeurs contemporains” at the Musée de design et d’arts appliqués contemporains, and “Quel flair! Odeurs et sentiments” at the Musée de la main. I read a good chunk of Sentir, Ressentir while I was in line at the DMV to renew my driver’s license. The book was absorbing enough to make me forget I was number 120 when the guy on the intercom was calling number 15. While the woman in line ahead of me complained about her knees and the family behind me chattered in Hmong, I was nodding along with Dominique Ropion’s comment that, unlike other senses, smell can’t be re-experienced without its source. (Think of a rose: You can remember exactly what a rose looks like and how its petals feel, but you can’t smell it from memory.) I admired Patricia de Nicolaï’s desire to make perfume that people feel comfortable wearing. I longed to get home to my bottle of Le Galion L’Ame Perdue after reading Rodrigo Flores-Roux’s description of its development. I felt sad, yet gratified, learning that Vero Kern (to whom the book is dedicated) had all along intended Vero Profumo Naja to be her final perfume. That’s just a taste of what Sentir, Ressentir has to offer. So much of the rest of the book stayed in my mind, too, or caused me to think, “Aha!,” such as when I read scientist Sylvain Delplanque’s explanation of why we have such a tough time naming odors, even if we recognize them. I also relived Maurice Roucel’s first day at Chanel, welcomed by Henri Robert, and I understood Isabelle Doyen’s vision, when creating Annick Goutal Un Matin d'Orage, of a gardenia bush "with deep green leaves, glistening , water droplets on the petals of the shell-like flower, and also a warm atmosphere, mist rising from the soil and light filtering through it...and, who knows why, floating over this whole scene, the white spaceship from 2001: A Space Odyssey." So far, I've talked about Sentir, Ressentir’s content, but the book fascinates as an object, too. It’s a paperback with an open spine showing the pink thread binding its pages and allowing the book to be laid open flat. Every page has some color — the pages shade to blue toward the spine — and many pages feature color photographs and illustrations, including arty portraits of perfumers laid out like a photographer’s contact page. I love a perfume book that tells stories about special fragrances and shows photos of fancy bottles. Who wouldn’t? Sentir, Ressentir is something different. Instead of focusing on the art itself, the reader steps into the artist’s studio and examine how the art transforms the person who experiences it. For me, Sentir Ressentir is a must-read for anyone serious about fragrance. Sentir, Ressentir is €28. It was released March 7 and isn’t yet available in the United States, but Fumerie has expressed interest in carrying it, and Nez’s marketing manager said it will likely be available at Luckyscent. 1. 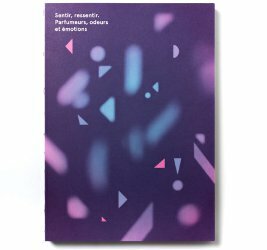 Sentir, Ressentir’s table of contents divides the books into three sections (contemporary perfumers; perfume and emotions: from the researcher to the perfumer; and scents and feelings), but to me the first section neatly subdivides into two categories: general essays and perfumer interviews. This sounds like a must-have to me. Thanks for pointing it out. It is sad that Vero Kern has passed away, but I feel comfort in the fact that she must have gotten so much out of it, and I feel really glad that she was able to complete her perfume collection. To me, the book was really enlightening! I feel the same way about Vero Kern. She seemed like a wonderful woman. I only had a few email exchanges with her, but she seemed like the sort of person it would be fun to have coffee and long chat with. I had the privilege of spending an evening with her in Paris, and she was indeed fun to chat with. Warm and vivacious. I have a feeling she left this world satisfied. That’s a comforting comment, T. Thank you for it! I meant to say “life” not “it”. I loved the little paragraph Denyse wrote about her in one of her best of lists. And I’m not surprised by Cazaubon’s comment, she gave this strong impression of having reached that enviable state of doing what she wanted to do, en fully enjoying it. Just forgot to ask: do you know if this will this be sold in book shops in Paris somewhere? It must be! Especially since Nez’s headquarters is in Paris. It might be worth emailing them to find out. Well I didn’t have time to email before I left for Paris last week, but a bookshop in the city who didn’t have it in stock themselves checked to see which other shop might have it and even gave me directions there. So I’ve got my copy and have already read most of the interviews. I’m really glad to have my copy and nice to get a bit of background about my favourite perfumers. Thanks again for the tip! Oh I will definitely read this, thanks Angela! I totally disagree with Ropion, though – we remember smells! Not exactly like smelling them, but I don’t think you can remember music exactly like hearing it or paintings exactly like seeing them either. So it’s really very much parallel. I’ve also gotten better at remembering them since getting interested in perfume. I remember smells more “in my head” than I actually re-experience them. Another thing–I’m not sure I’ve ever smelled anything in a dream. I know I’ve heard music and see color, but I’m not sure about smell. It’s all so interesting to think about. THANK YOU for saying this! I can smell in memory exactly as I can see or feel in memory. (I can also smell things in my dreams.) Thanks for making me not feel like a freak! I’m jealous! You’re not a freak. Maybe an anomaly–or not! I also think I can remember smells about as well as anything else. The actual experience is deeper, of course, but I think that’s also true of other senses. Maybe Ropion is more focused on scent and experiences it even more deeply, so that he is more aware of the difference between real and remembered with scent than with other senses? That’s a possible explanation! If his natural perception is deeper, his imagined perception might fall short to him. Will definitely order this when I get back to Montreal in three weeks. Thanks for the great review and enticing tidbits! Happy travels, and let me know what you think of the book! I hope you enjoy the book! I love to read, and I love perfume, so books involving fragrance are especially fun. I remember – and quite miss – the times when all my knowledge of perfume came from books. This sounds like it will help me reminisce as well as smelling perfumes of my past. The “marketing manager” is telling you now that you can find it on our website! Sorry, I hadn’t understood you were about to publish an article. We’re very grateful for that! I still haven’t checked with Luckyscent (and others), but I’m sure they will soon have it! So good to know about this—thanks, Angela!